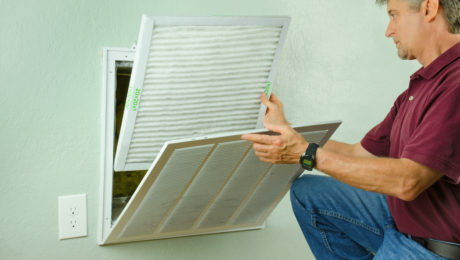 REGULARLY check and replace your air filters when dirty! This is the number one step all homeowners must have in mind and especially during the June-September months. If you leave a dirty air filter in your system, it will cause your system to work harder to cool the air and waste more of your energy and money. Review all the registers in your home to make sure they’re opened and not blocked by any items or furniture. Registers are designed to evenly cool the room so make sure no external factors are restricting their airflow. If some of your rooms are warmer or cooler than others, ask us about air balancing and zoning options to even the temperatures throughout your home. If possible, inspect your unit’s drip pan and condensate drain lines. Clogs found here can suggest mold and algae buildup and neglecting this issue can eventually lead to system malfunctions. Overall, the best thing you can do to ensure your system is ready for the hot summer is to get your maintenance or inspection today. Not only will this elongate the life of your system, but it’ll minimize unexpected failures and expensive repairs in the future. You can even save money on bills knowing that your system is performing efficiently! Call Colley for your Houston and Brazoria County AC services today (979) 265-4711!